NextReports Designer has a feature (action) which allows to validate queries, reports and charts regarding their query. Till 7.0 version, this validation only showed if something was wrong through a simple message and a warning icon inside browser tree. 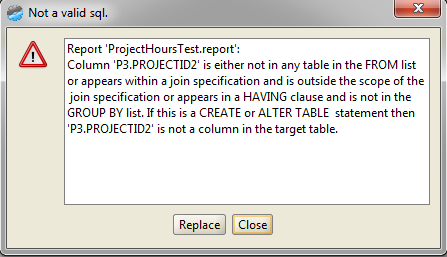 From version 7.0, validation process will show as result what is wrong with the query (sql error message). If more queries are invalid, a list with all the errors is shown. Validation process also takes care about parameters queries and sub-reports queries. This process does not show all errors from a single report (if there are more sql queries to test), but only the first. This validation process becomes very useful if you have many reports / charts created on some database tables /columns and some table name or column name was changed. By using the replace button, you can automatically do a case sensitive or a case insensitive replace from designer.